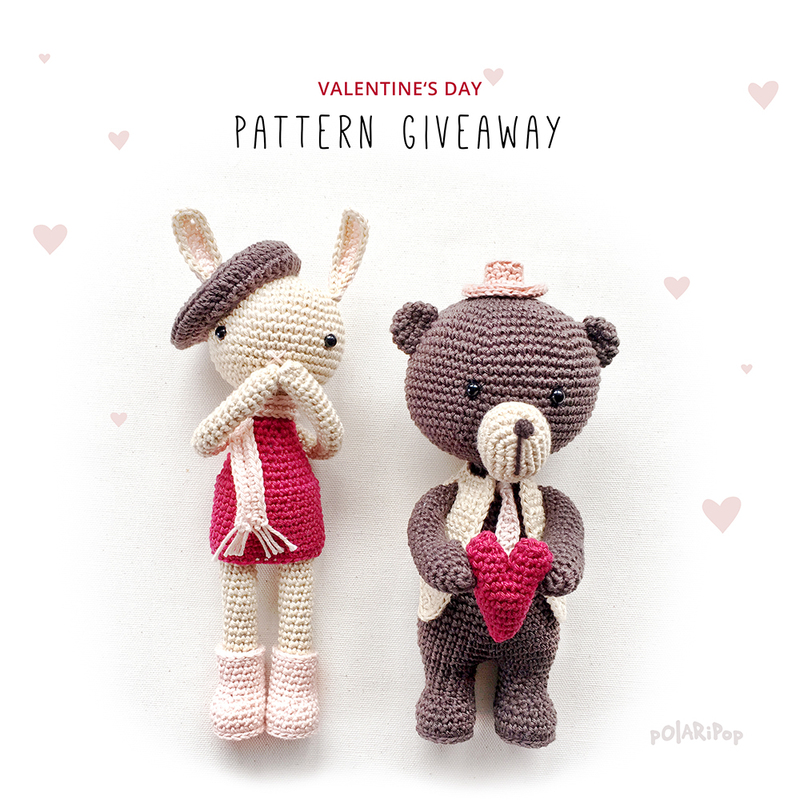 Win an crochet pattern for my amigurumi pattern set „Bunny & Clyde“. Congratulations! You will receive an email with the download links of the German + English version of Bunny & Clyde’s pattern in the next 24 hours (make sure to check your spam folder). 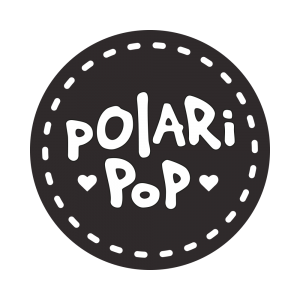 Of course we’d all love to see your posting your finished crochet animals in our Facebook group Polaripop’s Elves. Hey my dear crochet friends! Valentine’s day is approaching fast, and since I am sitting around at the doctors‘ offices a lot at the moment, there was not really time for designing a new pattern for this year’s most romantic day. So I thought: why not do a giveaway with my last year’s design, Bunny & Clyde, the most notorious pair of lovers in modern history. Follow them on their exciting adventures throughout the wild west. Always hiding, always on the run. Love is the only thing they never ran away from. To enter the competition, simply comment underneath this blog entry, what you have planned for this special day this year. Did you buy an expensive gift for your partner, or did you both agree on ignoring valentine’s day? What was the most special Valentine’s gift you ever got from your love? 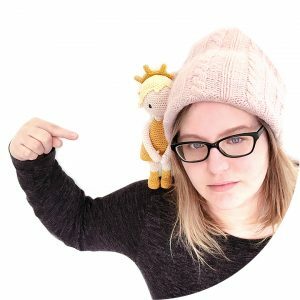 If you have any other crazy ideas for a crocheted Valentine’s day present, even if you might be single at the moment, you can also leave a link to a picture, blogpost or video here. Let me read (and hear and see) your stories! Be quick, the first 10 comments count twice!!! Winners will be chosen tomorrow (14.2.2018) evening (CET, Central European Time) , and informed here on this page and via email. This is an international giveaway. The pattern will be available for winners in German & English language. You need to leave your email address when commenting. Your email addresses will NOT be shown here on this page or anywhere else. Of course I will also not hand out your addresses to anyone else. YOUR DATA IS SAFE WITH ME! Please don’t forget to share this blogpost with your crochet friends! But to cut to the point, last year she fell in love with crochet. She started creating these amazing amigurumis, and manages to surprise me with each one she makes (I still don’t understand how she does it so well). She jumped into this new world full of inspiration and I can see how it makes her happy. As per usual, with anything that she does, I wanted to be a part of it. So I helped her with her own little shop. I made some artwork for her including logos, stickers, backgrounds…and we both fell in love with it. This is now a big part of her life, if she’s not working or sleeping, she’s doing crochet. The list of dolls she wants to make is already too big but she’s slowly getting through it. I’m always excited about seeing new ones she makes. Last year, on my birthday, I got a huuuge package from her. Among other wonderful gifts in it, there was Max. Max is a „pequeno“ (little) gray wolf amigurumi, with a Gryffindor scarf around his neck. She made him specifically for me. We call him our „filho“(son). I bring him everywhere with me. We sleep, travel, watch movies, go on adventures and take photos together. He means everything to me…to us. This Valentines day, we will not do anything special, but a week later, I will board a plane for the first time in my life, fly across the Atlantic ocean, and bring Max back home to her. We will spend 2 awesome weeks together, and I haven’t been this excited for the 21 years of my life so far. This is the greatest thing I’ve ever done and I couldn’t be happier. She made me fall in love with so many new things, including crochet and of course her. I wish everyone experiences this kind of happines in their life! With love, from Andressa, Jura and Max. Hi. My husband is working and we wont be together today. We planed a special dinner for next saturday. My husband always said to me „I love you more than yesterday, less than tomorrow“. Crocheting has been my healing therapy and it makes me calmer. I will be spending Valentine’s Day alone (kind of) since my husband is out of town for work. I say kind of, because my sweet elderly mother lives with us and she is here. I am not sad or anything, we will just celebrate hen he returns on Thursday! well, i’m love with someone who never leave the house because his mom is sick. Someones think i should broke up but i this this is the most sweet guy i can find, cause his love to his mom’s shows me how love i will get in the future. PS: i’m from brazil too… sorry about my english! I crocheted my great grandaughter a large pink camouflage heart pillow w/a pocket for her pj’s. She hugged me and told me that she loves me, made it all worthwhile coming from a darling 5 year old. So, my story is actually about my daughter. On New Year’s just after midnight my daughter got engaged. She was working (she is a dispatch officer for 911) & her boyfriend was allowed to be there with her that night. So at midnight she did the traditional „Happy New Year & it’s been a pleasure working with everyone“ over the radio. After she signed off she got up & announced that she had to go „poop“… Well, as soon as she said that, her boyfriend said, „You’re going to hate me but“ & got down in one knee & proposed. She said yes & needless to say she didn’t need to poop any longer. So fast forward to the other day where he gave her her Valentine’s gift early. He couldn’t wait for her to get home from work because he had a huge teddy bear (bigger than her) waiting for her and it was…you guessed it, on the toilet. I laughed so hard! Hello! My hubby is out of town this week for work. (Sob, sob.) It’s just me, my dogs, Walter and Alie, and my cat Louie spending valentine’s day together! Oh, and my foster dog, Hank!!! I am an old lady now and have been divorced for thirty five years. But I get great joy on Valentine’a Day seeing the love that my son has found with his wife of two years and the joy that being a husband and step-dad has brought him. And I celebrate the love I have found being a grandmother to a 13 year old girl who has become the light of my life and will always be my valentine! Valentinstag ist für mich ein normaler Tag. Ich freue mich viel mehr, wenn ich von meinem Mann einfach so zwischendurch Blumen bekomme. Dann kommt es von Herzen. Ich habe meinem Mann letztes Jahr etwas gehäkeltes geschenkt, weil er es so niedlich fand. My boyfriend is not a traditional romantic type, but sometimes he made sweet tiny things. And some more additional info about him: he extremely hates shopping, he becomes always stressful when we go to buy some food or other stuff. And he never cooks but is’s OK for me because I love to do things in kitchen. And he never eats egg. And one tiny information about me: I like to wake up lately at the weekends. So, at this particular Sunday morning he woke me up and told me he will go into the grocery shop. I was a little bit surprised so asked why. He replied, I am hungry. I was too sleepy, I answered just an OK. And slept back, but before I completely went back to my dreams I heard that he shaved himself in the bathroom. It was a little bit weird but as I mentioned earlier I was too sleepy. Hi, we are going to stay home watching football on tv… since there is a game on, there can’t be anything else planed. So I need some project to work on, while the game is on. Thanks, I would like a pattern. because I do not take Valentine´s day as a something special it will be just normal day for me. Das Leben ist hart und manchmal auch funny. Für uns sieht’s gut aus, ich liebe dich Honey! Das war Gedicht Nummer eins und es ist noch lange nicht Schluß! Ich fragte ihn darauf was er zaubert wenn er ein paar Tage statt nur ein paar Minuten hat? Seine Antwort: Ein Buch, der Titel: und plötzlich war sie da! Leute was soll ich sagen? ! es war wirklich noch lange nicht Schluss! Wir dichten jetzt fast seit einem Jahr immer wieder hin und her und such sonst sind wir super glücklich miteinander! Also hab ich ihm zum ersten gemeinsamen Valentinstag ein Buch gebastelt : Der Titel: Und plötzlich war sie da! Darin habe ich alle Reime und Verse aufgeschrieben die wir uns bisher geschrieben haben und ich hoffe das gibt eine never ending Story! I’m in a long distance relationship, so I can’t see my boyfriend but I found him a special card with his favourite animal and secretly posted it to him. He was really surprised to get colourful mail for once! Hello! Unfortunately, I will not be at home for Valentine’s this year beacuse I must go to a sportive competition with our small daughter ans we will back at night… But I bought socks and a valentine boxer for my Valentine!❤️Hope he will like them! Lo pasaré en familia con mucho amor! We are both introverts, so going out on one of the busiest days of the year was never going to happen. Hello to everyone and have a nice Valentine’s day! Tomorrow is a very special day because me and my love will complete two years of relashionship so i am planning to have a great and romantic dinner!I wish for love to all of you!